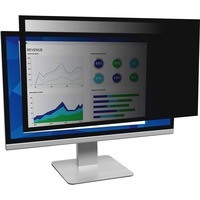 Framed Desktop Monitor Privacy Filter offers outstanding privacy protection, allowing only those directly in front of the monitor to see on screen data. Anti reflective surface reduces screen glare. Filter fits 16 to 17 CRT monitors and 17 wide screen LCD desktop monitors. Actual filter viewing area dimensions are 14 1516 wide x 9 12 high 379mm x 242mm. Attach with two easy to use methods 3M Command adhesive and attachable hanger arms. Filter helps protect the display from scratches and fingerprints. Easy to clean surface is smudge resistant and repels permanent marker.